I love reading to Ben my toddler. He is at that age where he really listens intently, and he also pulls the most expressive faces as I say the words. Every night, we try and sit together – me, Ben, Luke and Zak – and enjoy a story. Sometimes I read to them, other times Luke wants to do it. 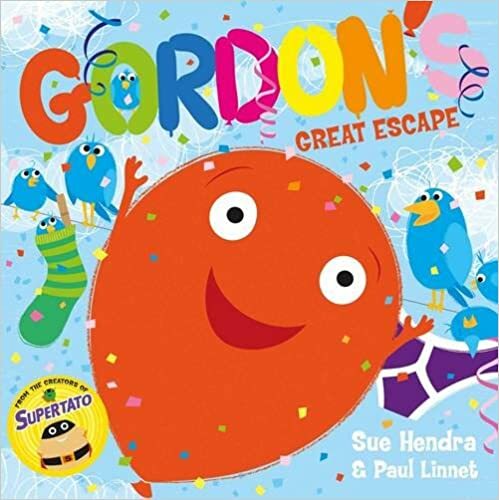 On this occasion, it was just me and Ben reading together and the story was Gordon’s Great Escape by Sue Hendra and Paul Linnet – A husband and wife team with a passion for writing and illustrating. They also happen to be very funny. The book is not too long, so good for a toddler with a relatively short attention span like Ben, and the illustrations in the book are wonderful. Bright and bold, with lots going on so you can spend just as long chatting to each other about what you can see in the pictures as you can reading the actual book itself. Ben loved pointing at the balloons when I asked him to find one of a certain colour. We have a book by the same writers called, Barry the Fish with Fingers. Luke, my eldest, loved that book as a little one and it became his bedtime favourite for over a month. Gordon’s great escape has had the same effect on Ben. We have read it EVERY night for 3 weeks now and he is showing no signs of wanting to stop anytime soon! Well, they do say kids love routine! I suppose I should note that the book ‘contains mild peril’ but it’s really nothing too traumatic, not like The Lion King…sob. It’s a tale of growing up, going on an adventure, being brave and saving the day. Things our kids do every day when playing in their own little worlds! If you would like to buy your own copy of Gordon’s great Escape, you can do so via this link. We would thoroughly recommend it – Gordon the balloon won’t let you (or himself – sorry, had to get that joke in there somewhere) down! Gordon’s Great Escape Activity ideas! If you’re looking for some ways to broaden your child’s understanding of the book, or if you’re a school/preschool who would like to do some activities around this story once you’ve shared it together, these Gordon’s Great Escape activity ideas are just the job! We had a go at at a craft from the sheets and chose to make a balloon pasta shaker/drum instrument. Ben has loved bashing it to pieces and shaking it to some music whilst charging around the house! Have a go yourselves using the activity sheets below! Disclosure: I was sent this book for the purpose of this review but all words, thoughts and opinions are my own..and Ben’s! Lovely post! Your review makes me want to read the book myself. I’m sure my little grandchildren aged 1-3 would love this book. GeorgieMoon recently posted…Colourful, vibrant, bright….